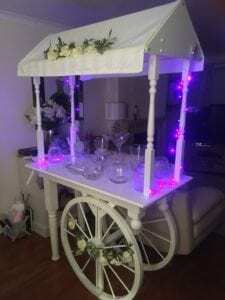 If you would like to add a photo booth or magic mirror or perhaps a stunning Led dance floor or maybe mood lights then you will find them and lots of other ideas on this page. If your ordering optional extras I will give you an all inclusive package price at a discount! Please let me know what your thinking about ordering and I’ll give you a special deal! Call me for details on 07472 287 151. 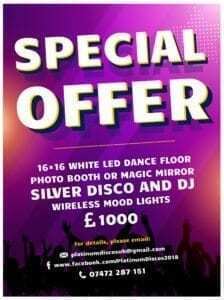 This is our current special offer for weddings: a 16ft by 16ft white LED dance floor with either a photo booth or the latest thing which is a magic mirror or selfie mirror as its also known as, plus our amazing silver disco which includes 12 wireless mood lights. All this for £1,000 delivered and set up! Karaoke is included with both my Silver and Gold packages but must be ordered. Our karaoke hire is amazing and has over 150,000 tracks and we use top quality radio mics so you’ll never sound better! We don’t use karaoke books anymore as they usually end up torn and smelly and out of date the week they are printed. Instead we ask singers to come and talk to the Dj and tell them what they want to sing and he will then check and take their name and call them up when they’re on. It’s much easier and more personal. I use two top quality microphones and use a separate mixer for reverb etc. This video show both the tops and bottoms that I use! These speakers are crystal clear and are top quality and these speakers only draw 100 watts from the mains per speaker! This is very useful when your in a venue with a limited power supply. These speakers cost just under £1000 each! I use two DSR 115 speakers with my silver disco and an additional 2 DSR 118W subs with my gold disco package! Bigger and smaller sound systems available POA. Use of sound system by a third party. I am happy for a band or soloist etc to use my sound system under my supervision providing they are careful and respectful of my equipment. This will incur an additional charge as I will need to use a different mixer and act as sound engineer. They must provide an XLR output from their mixing desk and provide all microphones, instruments, back line etc. I will only provide “front of house” sound. They will also need to sign an indemnity in case they damage my equipment. 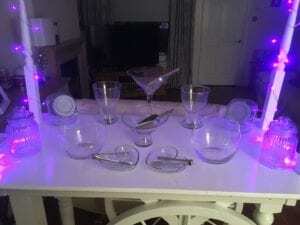 Mood Lighting hire: 12 conventional cabled mood lights that can be set to your chosen colour and placed around the room. 12 ADJ battery powered mood lights . (Very quickly set up as no cables to tape down and can be put anywhere). Ideal for weddings where a room turnaround is required. 12 ultra bright, wireless, battery powered, waterproof mood lights which can set to any colour. These can be used indoors and outdoors and once the disco starts and can be made to run sequences wirelessly. (These are very quickly set up as no cables to run for power and DMX which would usually need taped down) Ideal if your having a room turnaround after your meal! These lights cost 7 times what a standard mood light costs because they are battery powered and have wireless DMX control. 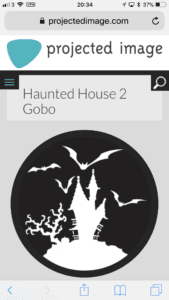 This means I can dim the mood lights from the DJ console and set colours and patterns at the touch of a button! To say it looks good is an understatement! 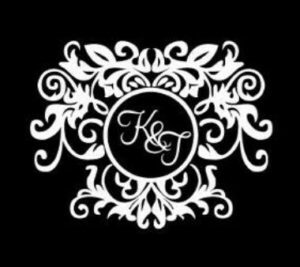 Here is a video taken at The Huntingtower Hotel In Perth which shows you all the key features of these amazing wireless mood lights. These lights are also fantastic if your venue has poor control of its house lighting with a lack of zones or dimmers! These mood lights provide enough light so that all the venues lights can be switched off and then I can dim, change the colours etc to suit the mood of the night. These lights cost £4000 for a set of 12! Here’s a video I took of them at a gig on the 14th of October 2017 at The Atholl Palace Hotel in Pitlochry. Music for ceremony including separate sound system and operator as required and your choice of music. We can do this wirelessly. Video disco with 5ft screen built into the front of the disco which can display photos, videos, messages etc. Or video disco with an 8ft screen hung from either side of the disco. 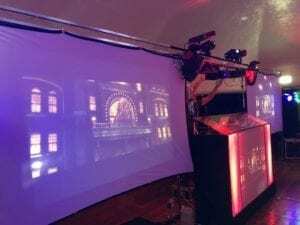 I offer a twin screen option, one on either side of the disco, hung from trussing, it looks amazing but needs a very wide stage! Two 10ft video screens with a 5ft screen on the Dj booth. Ideal for playing home videos, music videos, wedding videos etc. The ultimate video package with 3 big screens to project your wedding videos or home videos on or even music videos! 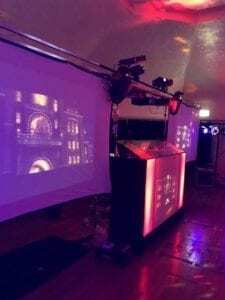 Our video disco hire with 10ft big screens to the left and right of the Dj console and a central screen on the front of the Dj console. (This is only suitable for larger venues with a stage of approx 26ft (8m) across and 10 ft (3m) ceiling height. 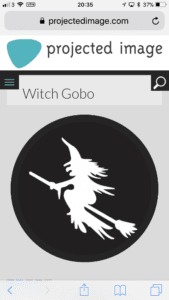 Magic mirror/Selfie mirror: We have a brand new Selfie mirror that is easy to use and will allow your guests to take photos easily and create a photographic record of your event. we also include a box of props to add some fun to the photographs. Magic mirrors are hired out for four hours and come with unlimited prints, a supervisor to make sure everything works perfectly and optional photo album and copies of the photos on a flash pen. We have a brand new photo booth and props for your guests to use to create interesting and fun photographs. This inflatable booth is quick and easy to set up and has a height of 8ft (2440mm). The selfie pod we put inside the photo booth is really clever. It can send your photos to social media or physically print them out on our high quality printer! 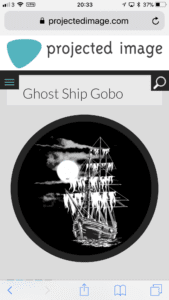 You can also get multiple copies of a photo you like! We can also supply a photo album where your guests can write comments about the photo they’ve taken and some thanks to you for inviting them! The photo booth is manned for the duration of the hire and we give you unlimited prints for 4 hours. 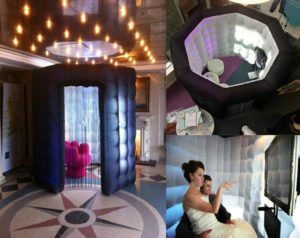 This photo booth is ultra modern and stylish and looks amazing! The room needs to be 8 ft tall to accommodate the height of this booth. Our new inflatable booth. Quick to set up and contains our new selfie pod that can print photos and can also post them to your social media! 6m wide by 3m tall white backdrop with stand and fairy lights which is Ideal for putting behind the top table. The backdrop can have 6 or 12 up lighters added set to your wedding colours. 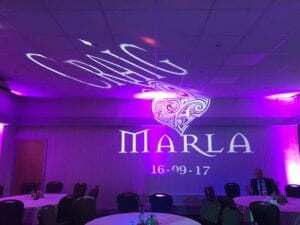 Full colour laser light show which can also project your names in laser light all around the room! The 360 degree lighting package. This means that there will be 1-2 lighting stands at the other end of the room with lights on them and they are connected to the disco by wireless DMX so the room is lit from both ends and all the lights do the same thing at the same time! This covers the entire room with light! 15 X 15ft portable dance floor in various colours. Black, white, chess board style or parquet. 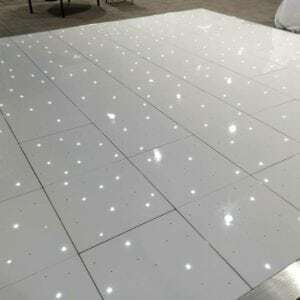 16x16ft White Led dance floor. This is just an example photo of the white floor that we bought. 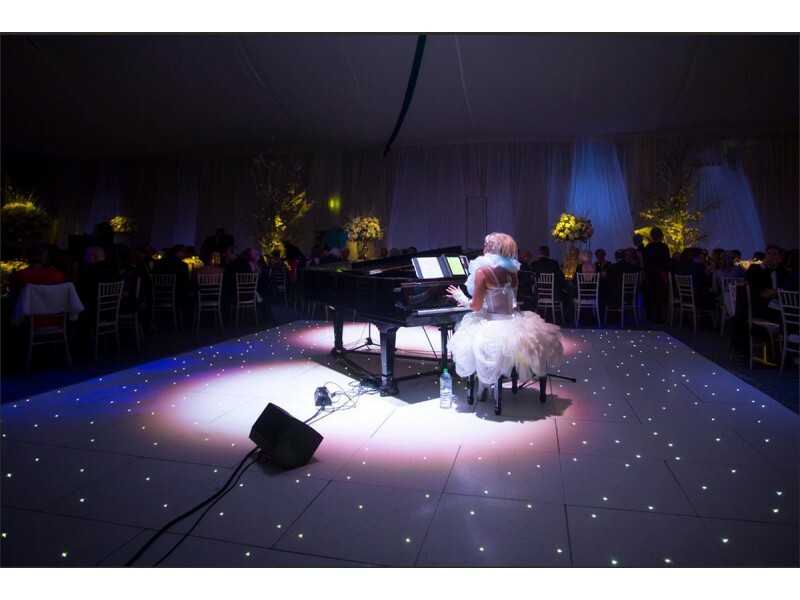 Platinum Discos white LED dance floor. Available in various sizes. 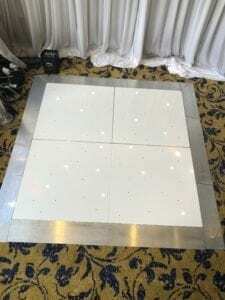 White Led dance floor demo for a wedding fair. COMING SOON: 16 x 16ft Colour Commander dance floor which can write your names, do the saturday night fever coloured panels and lights up when you step on it like in Michael Jackson’s video! It’s the most amazing dance floor you’ll ever see and will be the talk of your wedding day! We have several giant ” LOVE ” letters and Mr and Mrs letters both in 4ft and 5 ft heights. They are illuminated with white led lamps and we can supply them in a normal or antique effect. 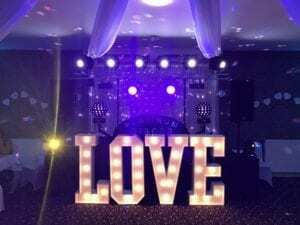 We also provide giant love letters which are 5ft tall with multicoloured lamps which are DMX controllable and do multiple colours and sequences! Please let us know what you require as we are continually updating our stock. 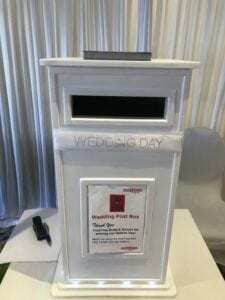 Wedding post box in white. 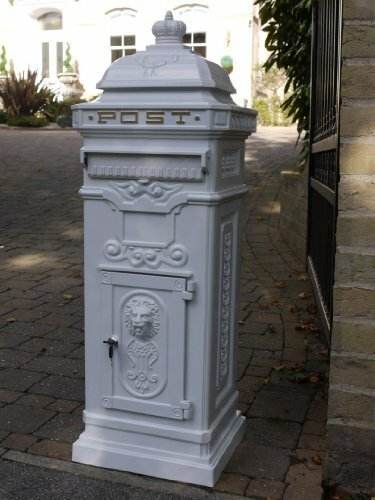 Our amazing white post box looks fantastic and is around 4 ft tall! Our smaller table top post box. This can be personalised with photos and your names. Food related items: Candy Carts, Ferris wheels. 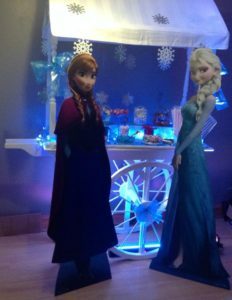 Our beautiful Candy Cart comes with a variety of sweets. 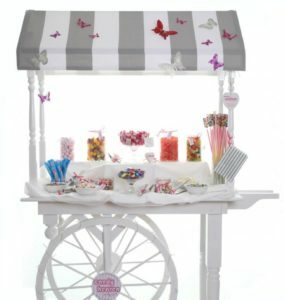 Hire our lovely Candy Cart which has 12 different kinds of sweets and includes bags and tongs. 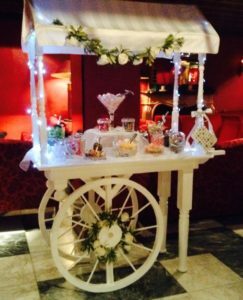 Candy Cart hire available throughout Scotland. Low Smoke machine to create clouds (dry ice type effect) and is not suitable for venues with smoke detectors. Dry ice, dancing on the clouds effect. The best method but dry ice is expensive to buy as is the machine that produces the effect. This is the ultimate effect and doesn’t set off venue smoke detectors! 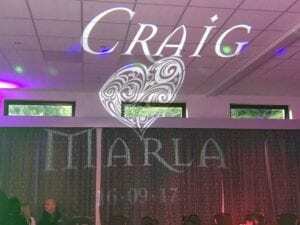 Custom Gobo for a wedding. Love hearts projection. I can project love hearts in red or pink all over the walls ceiling and floor using 4 led projectors with a custom made love heart gobo. It looks absolutely stunning and I’ve never seen anyone else do it! The ultimate romantic lighting effect! 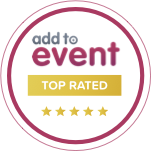 For the ultimate wedding I have my all day wedding package that has a separate sound system for your ceremony and top quality radio mics for your speeches. I will be there early setting up all the equipment so when you arrive everything that can be set up will be! I’ll be on hand all day to assist in the organisation and running of your wedding and making announcements. With this package you’ll also get either the silver or gold disco plus wireless mood lights and love letters. 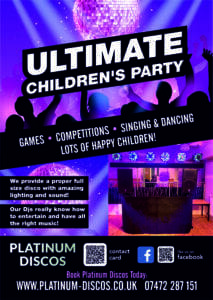 UV lighting is another amazing optional extra for the ultimate UV glow party. Add the bubble machine with UV BUBBLE fluid for a phenomenal glowing bubble effect or get the standard bubbles! We have a huge range of bouncy castles in various sizes and themes. 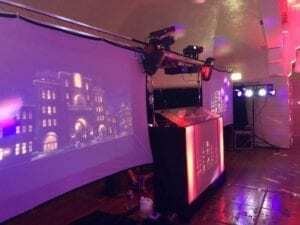 Projector and screen hire. 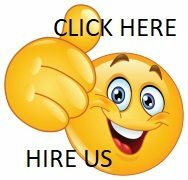 We can hire you a projector and screen which you can either attach a laptop to or an iPhone or iPad. (We have all the apple video connectors) We also have HDMI and VGA cables for connecting to most devices, We can offer advice on connections. The projector and screen is great to hire because you can put your wedding video on it for the night time guests to see! For birthdays you can play a video or a slideshow of the birthday boy or girl as they’ve grown up! Its great fun also for engagement parties and anniversaries and nice to look back on your lives! All our services are provided nationwide in Scotland from the very north of Scotland from Lochinver, Thurso and Wick down through Aberdeen and Inverness to Perth and Dundee. We also cover the central belt all the way from Glasgow in the west to Edinburgh in the east and all the towns and villages nearby. We also go right down to the borders and some of our most visited areas include Dumfries, Stranraer, Hawick, Galashiels, Selkirk, North Berwick and Dunbar. To book an optional extra please fill in the contact form.